Swarm of locust's started to invade Israel that has recently devastated crops in Egypt. Reminding the days of Moses and ten plagues which came upon Egypt as one plague being that of locusts. Yahoo in its news section posted the below words. Israel on 6 March 2013 began battling a swarm of locusts from Egypt to prevent crop damage in the south of the country. 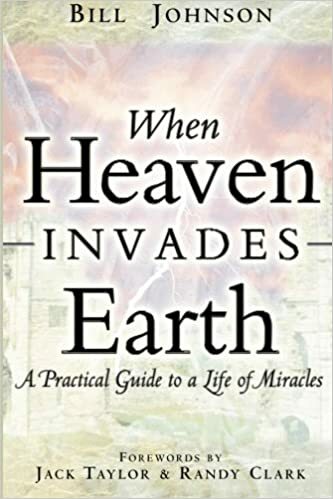 Locust clouds darkened skies some three weeks before the Jewish Passover holiday that recalls 10 Biblical plagues, one of them locusts, that struck Egypt during the exodus of Israelite slaves. The insects covered nearly 2,000 acres of desert overnight, officials said. 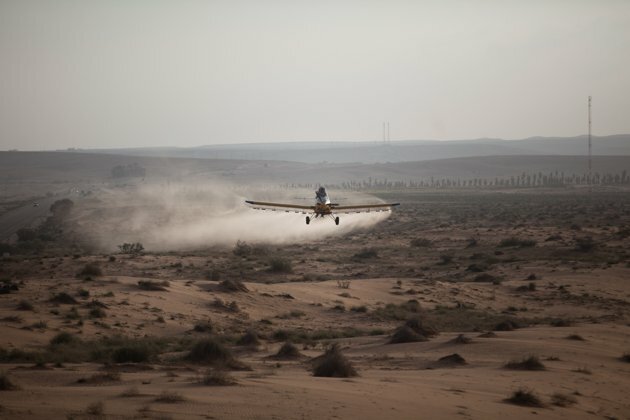 Israel sprayed pesticides from the air and land to try to kill them in the early morning before dew on their wings dried and they could take off again. 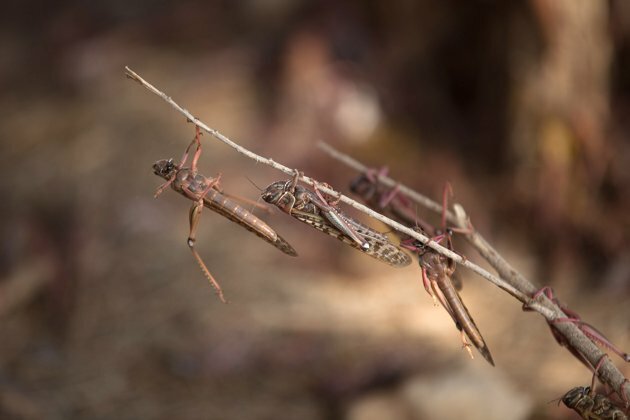 Locusts, which wreak havoc by eating crops, last invaded southern Israel in 2004. Israel is now on locust alert as these have destroyed crops of neighboring Egypt just before the passover holiday. Israel's Agriculture ministry has kept an emergency hotline asking for any sightings of locust to prevent an outbreak. 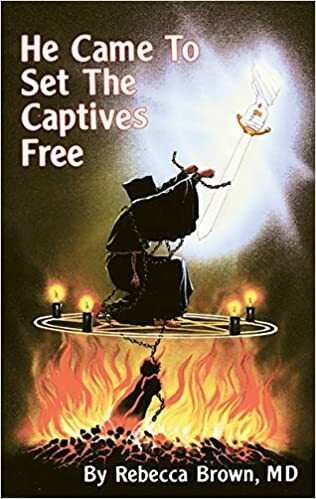 Some even suggested to have them as a diet but Rabbi's don't prefer that method. Among the chief promoters of locust cuisine is Israel, chef Moshe Basson, who appeared on a morning news program Wednesday to offer advice on whipping up concoctions with the insects. "They taste something between sunflower seeds and baby shrimps; they actually don't taste like much," Basson told the U.K.'s The Guardian. "I like them, but they're desired not because they are delicious but because they are rare." 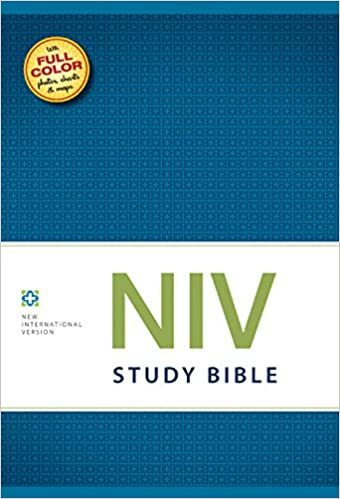 As I was going through comments underneath a news article about locusts I saw a comment which made me smile a bit it says "So the Bible speaks the truth. Does this mean Moses is on his way?". 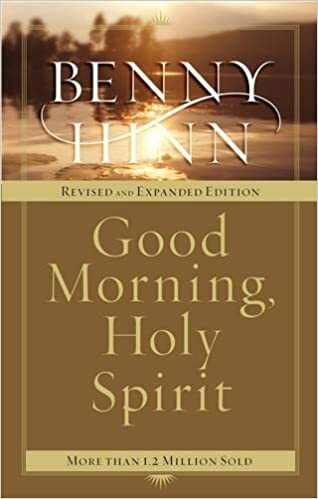 Why would this incident be a sign of arrival of Moses? Any how this may or may not be the sign of end time we should see in future what happens. I have collected some of the photos from a news website which can be seen below. Locusts hang on a tree as a Swarm of locusts arrives in Israel near the Egyptian border on March 6, 2013 in Kmehin, Israel. A light plane sprays pesticides as a Swarm of locusts arrives in Israel near the Egyptian border on March 6, 2013 in Kmehin, Israel. Egypt and Israel have been swarmed with millions of locusts over the past few days causing wide spread disturbances. 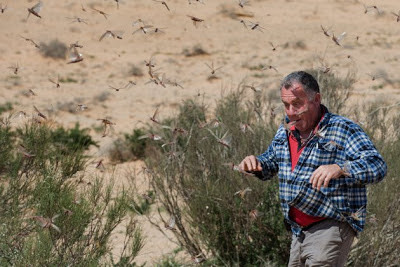 An Israeli man runs through a swarm of locusts arriving over the Negev desert near the Egyptian border on March 6, 2013 in Kmehin, Israel. Egypt and Israel have been swarmed with millions of locusts over the past few days causing wide spread disturbances. 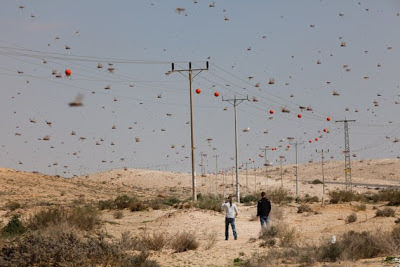 Israelis look at a swarm of locusts arriving over the Negev desert near the Egyptian border on March 6, 2013 in Kmehin, Israel. Egypt and Israel have been swarmed with millions of locusts over the past few days causing wide spread disturbances. Locusts fly near a car belonging to experts as they map the swarms of locusts near Kmehin in Israel's Negev desert March 5, 2013. The Israeli Ministry of Agriculture and Rural Development said that the location of the locusts which crossed into Israel from neighbouring Egypt had been mapped and and will be fumigated on March 6. Locusts rest on a branch near Kmehin in Israel's Negev desert March 5, 2013. 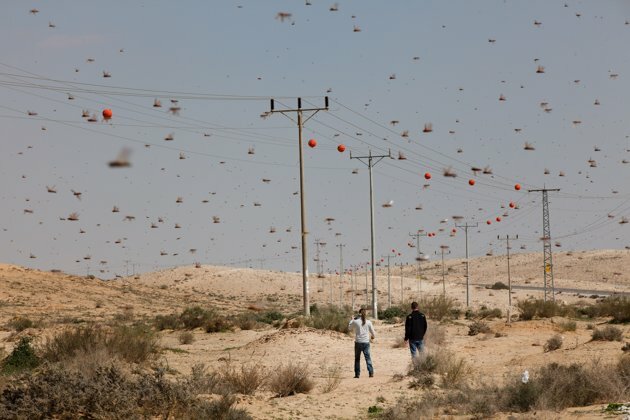 A swarm of locusts fly near Kmehin in Israel's Negev desert March 5, 2013.